The pangolin is a mammal native to both Africa and parts of Asia and its future, as is the case for most wild animals, looks grim. 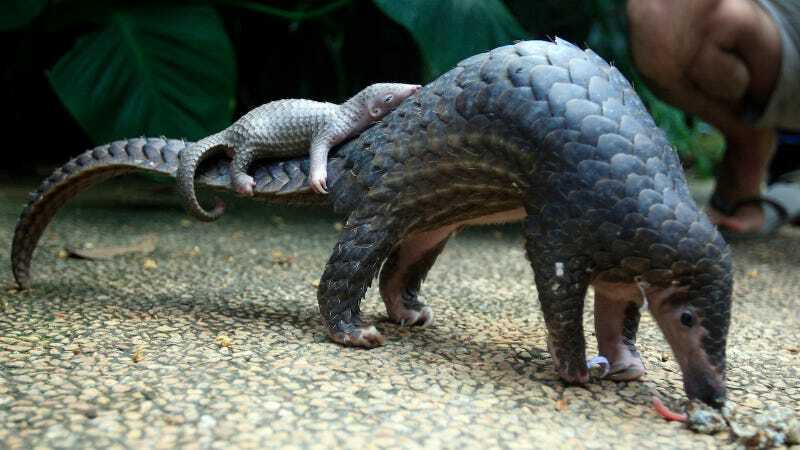 NPR reports that the pangolin is the most widely trafficked mammal in the world, both for its meat and its distinctive scales, which some practitioners of traditional Chinese medicine believe to have healing properties for all sorts of ailments. In early December, Chinese officials seized 3.4 tons of illegal pangolin scales hidden in a shipment of wood products from Nigeria. It was the Chinese government’s largest pangolin scale seizure ever. What do you know. Pangolin trading was officially banned in September by delegates at the Convention on International Trade in Endangered Species of Wild Fauna and Flora in Johannesburg, who moved them to the “threatened with extinction” list, the highest level of protection. The Asian pangolin is essentially gone, according to Jonathan Baillie, pangolin specialist at London’s International Union for Conservation of Nature. This has increased the demand for African pangolins which, before their elevated status, was perfectly legal with the right paperwork. Pangolin’s protective scales are actually keratin, the same material as our finger nails, and about as effective in combating disease. Between 5,000 and 7,500 pangolins were likely killed to produce the amount of scales seized.